Most monsters know better than to mess with Princess Harriet Hamsterbone. She's a fearsome warrior, an accomplished jouster, and is so convincing that she once converted a beastly Ogrecat to vegetarianism. So why would a pack of weasel-wolf monsters come to her for help? Well, there's something downright spooky going on in the forest where they live, and it all centers around a mysterious girl in a red cape. No one knows better than Harriet that little girls aren't always sweet. Luckily there's no problem too big or bad for this princess to solve. 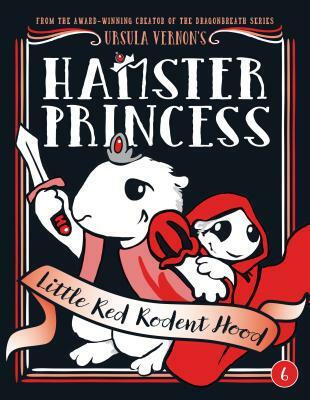 In this sixth installment of her whip-smart Hamster Princess series, Ursula Vernon once again upends fairy tale tropes and subverts gender stereotypes to brilliant effect. This is a "Once Upon a Time" like you've never seen before. Ursula Vernon is a full-time author and illustrator whose work has won two Hugo Awards and been nominated for an Eisner. She loves birding, gardening, and spunky heroines, and thinks she would make a terrible princess. Ursula lives with her husband in Pittsboro, North Carolina.